This is a paragraph on adolescence for SSC and HSC. 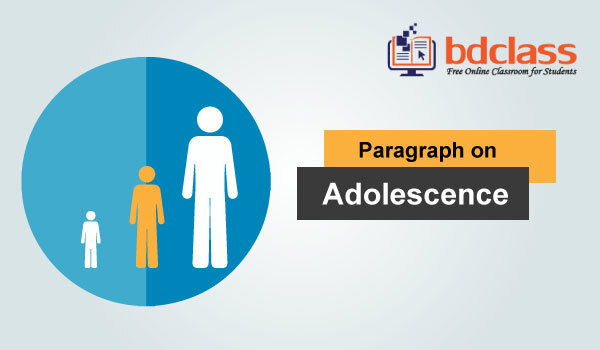 Here is described meaning of adolescence, adolescence problems and how should we behave with an adolescent boy or girl. You can also use this adolescence paragraph for class 8, 9 and 10. Adolescence is a changing stage of physical and physiological development that happens during the period between between childhood and adulthood. This is an important a part of life. this is a really critical period of life. In adolescence, girls and boys float in a very vibrant and fantasy world. Thus everything looks vibrant to them. That is why they will go wide. Adolescence may be a time of risks. Unlimited freedom brings disasters for them. They rush to the path of destruction without knowing the consequence. Adolescent may be a youth who is developing from a child to an adult. They may be addicted to alcohol, cigarettes and alternative drugs that may cause deadly diseases.They are also in danger of sexual relationship which wheel lead them to intentional and unintentional crisis or risk. Many of them face a wide range of adjustment and mental health problems. So, it is necessary to be very careful about everything that can be life threatening. It is also important to teach them that alcohol, cigarettes and other drugs may destroy their life. Moreover, they must be given religious teaching besides general education.